Each player played one 15-minute rapidplay game against a player from each other team. It was a hard-fought affair. 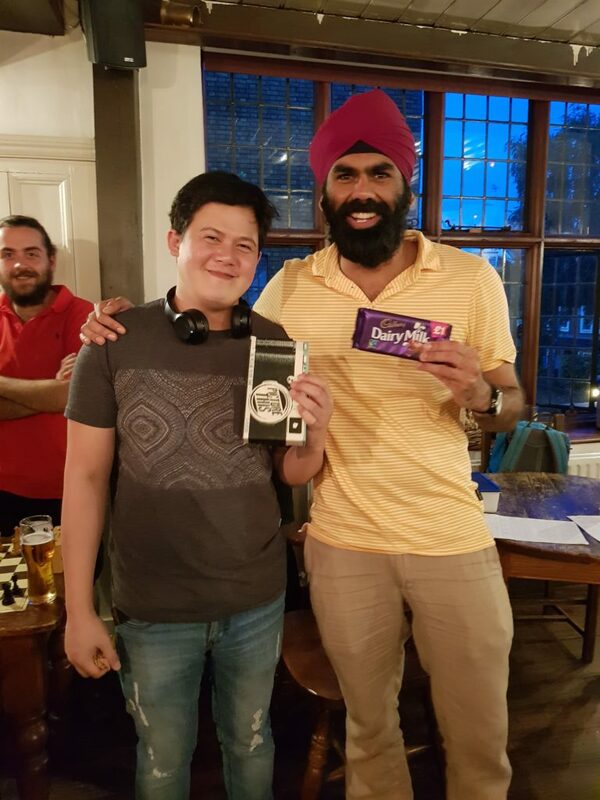 Alekhine Athletic emerged victorious, with Jay and Dipender dropping just half a match point, winning a tasty chocolate bar and an exciting card game. Player of the tournament was Dipender, scoring three wins out of three. He had clearly put a lot of preparation in, and I think everyone, especially me, learnt a lot. The next training session of the summer will be hosted by our chairman Bajrush on 7th August. Finally please note the upcoming Monday 24th July session, originally planned for Cafe Nero, has been moved to the Albion after a poor showing from the regulars last time. See our schedule for full details of the summer programme. I don’t think I actually said to avoid theoretical openings. I pointed out that they can be impractical for busy/lacy amateurs, mostly to put context to why both of you in this game played “system chess” and essentially ignored what the opponent did for the first 8-9 moves. Quite a difficult game to work with, but because it was so different from the usual fare, gave us an opportunity to focus on some different aspects of the game. Finally, a plea for submissions for the next one. That should of course have been lazy, not frilly amateurs! Previous Previous post: C4, D4, or E4… that is the Question? Next Next post: Castling… at the Elephant?